The story of how Margaret came to Tasmania is yet to be written. Evidence at the moment is non-existent but family legend has it that she was a governess to the Cox family of Clarendon House near Evandale, Tasmania. She met Thomas Todd Cooley whilst he was working as a farrier. However the mystery surrounding the ancestry of Margaret has been solved thanks to Foster Budworth in England. I have reprinted an excerpt from "The Thomas Todd Cooley Story" which covers this particular part of the tale. Excerpt from "The Thomas Todd Cooley Story"
"In 1836 Thomas Cooley applied for permission to marry a Margaret Paterson, a procedure which as a convict he had to follow. She was a spinster and a free arrival. They were married on 30 May 1836 in Trinity Parish Church, Hobart, in the County of Buckingham, the church used for convict marriages. Banns had been read and a Marriage Certificate No. 267 was issued. P. Palmer, the Rural Dean, officiated and the witnesses were Richard Meredith and William Burton, both of Hobart Town". The Family Register (below) lists Thomas and Margaret and their six children. Most of the writing appears to have been done in the same hand, with the only additions the date of death of Margaret and (nee Edmondston) under her other names of Margaret Aberdeen Cooley. This caused many of us to spend months and even years of worrying over just what her maiden surname was! At the bottom of the Family Register page is written "W.R. McPhun Bookseller & Publisher to H.R.H. The Prince Albert, 84 Argyle St., Glasgow." Was this page, or book, sent to Margaret by some of her Scots family in Edinburgh? But who was Margaret Paterson? This puzzled various researchers for many years. She was not the daughter of Lt Col Paterson, founder of Launceston, as he had no children. She was not the daughter of Miles Paterson, who arrived at Hobart on the "Castle Forbes" with his wife, 3 sons and 3 daughters on 1 March 1822 as the girls ages were wrong. These were the only Pat(t)ersons who could be found in Van Diemens Land at the time. The mystery deepened when a letter came to light from Edinburgh addressed to Mr Thomas Todd Cooley starting "My Dear Brother-in-Law and My Dear Sister" and signed by John Edmondstone Jnr. In the letter he referred to "our mother". The registrations of Thomas and Margaret's 6 children do not help. The first 4 were registered at the same time, having consecutive reference numbers, and show the mother's name as Mary Cooley, formerly Aberdeen. The fifth shows her as Mary Aberdeen Cooley formerly Edminson ~(sic) and the sixth as Mary Margaret Cooley formerly Aberdeen. She signed a letter to one of her daughters "Your affectionate mother, Mary Cooley". The notice of her death in the local press and her tombstone refer to her as Margaret Aberdeen Cooley. When the first 3 children were baptised in 1836, 37 and 38 she was registered as "Mary Cooley". Thomas was shown as "Farrier". A descendant, Thomas Charles Todd Cooley states in several of his letters that she was Mary Elizabeth Aberdeen Scott, sister of Sir Walter Scott and a great aunt of Captain Robert Falcon Scott (Scott of the Antarctic) and of the then Duchess of Gloucester! He claimed that his grandmother had documentary proof of this but that her husband destroyed the papers on her death. He alleged that she was banished from her "good family" for marrying beneath her. He also says that Thomas Todd was married twice, Margaret being his second wife, but this is not so. Mrs Margaret Morse of Victoria, a descendant of Thomas Todd and an elderly lady in the early 1990s remembered as a young girl meeting Elizabeth Allen Cooley, Thomas Todd's second daughter. She had always thought that the mother's name was Edmondstone and had only recently heard the name Paterson mentioned. Thus Thomas Todd Cooley's wife was a Margaret or Mary Paterson or Aberdeen or Edmondstone! All attempts to resolve this mystery by several people failed until a professional researcher in Edinburgh was asked to delve into Scottish records held in that city. In the early 1700s one James Aberdeen of Carmyllie Parish in Scotland married Jean McNeish. They had at least 4 children, 2 of the boys, William and John, marrying 2 sisters, Margaret and Elizabeth Forrest. John was a gardener at Kirkbraehead and married Elizabeth on 26 November 1761. They had at least 8 children between 1762 and 1783, one of these being William, born on 23 March 1768 and baptised on the following day. William became a Quarrier/Labourer. His marriage cannot be traced but was probably around 1792/93 judging by the dates of birth of his 6 children. Their birth and baptismal registrations all show William and his wife Elizabeth nee Allen to be the father and mother so there is little doubt that they were married. Perhaps they were married "irregularly", ie with no banns called, which though frowned upon frequently happened. The youngest of these 6, born on 12 October 1804 but not baptised until 28 December in that year was Margaret Paterson Aberdeen. Why Paterson is not known; perhaps it was a family name on her mother's side. There seems little doubt that this is the Margaret who became Mrs Thomas Todd Cooley. Researchers have always thought that she was born on 12 December 1805. This was probably due to the newspaper report of her death saying that she was in her "67th year" which literally means that she was 66 but probably meant that she was 67. Births and baptisms were usually within a few days of each other because of the high infant mortality rate but here there was a gap of 21 months. 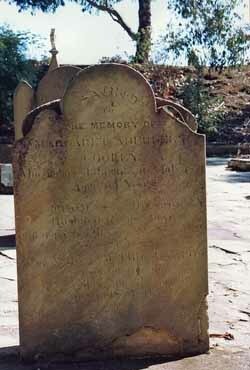 And of course Thomas' and Margaret's second child was called Elizabeth Allen Cooley, her mother's name, the first having been named Sarah Morris Cooley after his mother. William Aberdeen died "of Decline" on 24 February 1807 at the early age of 38. Elizabeth was re-married on 8 February 1811 to a John Edmondston, eldest son of Alexander Edmondston and Margaret nee Chrystal or Cristal. He was born on 24 September 1781 and so was aged 29 when he married. He is described as "Porter". John and Elizabeth had 2 children, the eldest being John Junior born on 17 January 1812. He was thus 7 years younger than Margaret Paterson and was her half brother. Hence the remark in his letter of 1842 "Have you put on mournings for our mother?". Presumably Elizabeth had but recently died. When Elizabeth married John Edmondston Senior she was described as "daughter of John Allan, Broker" rather than as "Relict of William Aberdeen". This suggests that in the 4 years between William's death and her marriage to John she went to live with her father. When John Senior and Elizabeth set up home together they probably took in her children by her previous marriage. 2 boys had tragically died within a fortnight of each other in 1805: William aged 11 of "a Bowell complaint" and John aged 5 of "Asma" (ie Asthma). This left Elizabeth aged 14 in 1811, Helen aged 12, Robert aged 8 and Margaret herself aged 6. She obviously grew up feeling more like an Edmondston than an Aberdeen. Half brother John Junior married Marion Scott in about 1833, their first child Robert Stuart Edmondston (named after his Uncle) born in 1833 in Edinburgh. Subsequently they had 5 more children, all girls. The middle 3 were Margaret born in 1842, Marion in 1844 and Martha in 1847. These were the 3 names given by Thomas and Margaret Cooley to their 6th and last child, also born in 1847. John became a Printer/Compositor and lived at 122 Rose Street in Edinburgh, the next street parallel to and north of the main thoroughfare of that city, Princes Street. Though his father was a Porter, John Junior was clearly an educated man as his letter written to Margaret in 1842 shows, including as it does some poetry which he had written. Margaret too was well educated as her letters and the way in which she was bringing up her children indicate. John died of "Cerebral Apoplexy" on 22 May 1878 some 7 years after his half sister Margaret, at the age of 66. His wife Marion survived him by almost 7 years, dying of "Chronic Peritonitis" on 5 January 1885 aged 72. The registration of her death shows her then to have been living at 30 Lauriston Street, quite close to Edinburgh Castle. Her age was wrongly stated to be 74. The informant of both deaths was Charlotte, their youngest child, by that time aged in her 30s. Margaret Cooley also had a younger step-brother Robertbaptised on 14 August 1813 so probably born a few days earlier. How did she come to be in Van Diemens Land? We know that she married there in May 1836, a year after half?brother Robert's arrival. Did she perhaps follow him to keep any eye on him and to seek to get him to mend his ways? How did she come to meet Thomas Todd Cooley? Was she, as Thomas Charles Todd suggests in one of his letters, a governess to the children of James Cox at Clarendon House when Thomas was working there? It is known that there was a governess, not surprisingly since Cox had 7 children by his first wife and after she died a further 8 by his second! Why did she omit her surname when she married? Was it shame as she was heavily pregnant ? her first child was born only 5 days after the wedding! Or did the clerk think that she said she was Margaret Paterson from Aberdeen and she did not bother to correct him? Why did she call herself, Mary? Was it just that copiers of old letters mistook an 'a' for a "y" her shortened name? "COOLEY : On Sunday 30th July, Margaret Aberdeen, beloved wife of Thomas Todd Cooley in her 67th year. Funeral 2.30pm on Wednesday 2nd August. St Johns NewTown"
Thomas Todd Cooley and his wife Margaret Aberdeen Cooley were both buried at St Johns Church of England, New Town, however their headstone has twice been relocated. It was in the south eastern corner (near Crematorium Chapel) of Cornelian Bay Cemetery in Hobart but this area is now a rose garden. A visit in December 2006 showed all the headstones have now been moved again, this time to an area on the corner of Pontville & Kingborough Parade, not far from the War memorial walls. The headstones are grouped together quite closely and Thomas' is in the back row. A sign reads "St Johns Park Headstones and Queensborough Memorials". There is a substantial amount of information concerning Margaret's family whom she left behind in Scotland. Follow this link to a page about the Edmondston and Allen families.